The After School Program (ASP) serves Covenant’s neighborhood children, primarily from the National Coach community. Volunteers share the gospel that the children might know Christ and walk with Him for His glory, while meeting academic needs in a safe environment. Serving in the After School Program commits you to one afternoon a week throughout the school year. Get the After School Program color brochure. 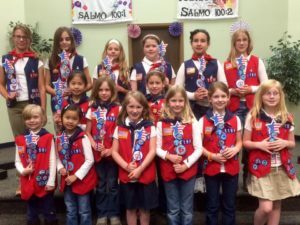 American Heritage Girls is a national Christian girls’ scouting program that emphasizes the teaching of life skills, social development, leadership, teamwork, spiritual development, and character development. Founded in 2014, our troop is VA 1199. The first girls to join chose these numbers inspired by Psalm 119:9 which says, How can a young man keep his way pure? By guarding it according to your word. To find out more about our troop contact lisa@cov-pres.org, and for more information about the national organization go to: https://www.americanheritagegirls.org. Backyard Bible Club serves neighborhood children in the Mosby Court apartment complex, reaching out to them with the love of Christ through games, music, Bible stories, crafts and more. Backyard Bible Club meets Thursday afternoons during the school year. Children’s Choir at Covenant includes those in Kindergarten through 6th grade and meets in Annex 6 from 4:00 p.m. to 5:15 p.m. most Tuesdays during the school year. We have a great deal of fun as we learn the basics of sight singing, rhythm and pitch, and develop good singing habits. With an emphasis on giving glory to God in all that we do, the choir prepares three or four songs a year to help lead the congregation in worship. For more information contact Lisa Updike. Covenant Play Group is for mothers and their children to engage with each other and other families through play! All children are welcome, although activities are geared towards toddler and preschool-aged children. The play group meets Mondays 9:30 a.m. to 11:30 a.m in the activity room unless otherwise noted. Click here for the events current schedule. For more information contact Grace Weniger or Carrie Rash.